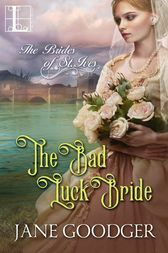 As if being left at the alter for the third time isn’t bad enough, Lady Alice Hubbard has now been dubbed “The Bad Luck Bride” by the London newspapers. Defeated, she returns to her family’s estate in St. Ives, resolved to a future as a doting spinster. After all, a lady with her record of marital mishaps knows better than to dream of happily-ever-after. But then Alice never expects to see Henderson Southwell again. Her beloved brother’s best friend disappeared from her life soon after her brother’s death. Until now . . .
Jane Goodger lives in Rhode Island with her husband and three children. Jane, a former journalist, has written numerous historical romances. When she isn’t writing, she’s reading, walking, playing with her kids, or anything else completely unrelated to cleaning a house. You can visit her website at www.janegoodger.com.